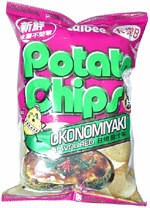 Taste test: These are really, really tasty chips. It's hard to describe the taste, and I don't honestly know what okonomiyaki really is, but the blend of spices is very flavorful and delicious. Our pickiest eater says: It might taste like a Chinese tostata, but I've never had a Chinese tostata, so I don't really know. Not very good  I wouldn't eat more than four of these chips. It's an acquired taste.